Speedcross 4 vs Speedcross 4 GTX are trail running shoes that are suitable for difficult and challenging climbing sessions. They are nimble and responsive, allowing you to climb with ease. However, they are indeed equipped with different features. Continue reading below to find out the differences between these two models. – Which shoe model that is more recommended for the money. Those who are familiar with the fit of old Speedcross models may find an immediate comfort with Speedcross 4. The sizing is precisely similar to the predecessors, featuring a snug toe box that is more suitable for people with average to narrow feet. One thing for certain, Speedcross 4 is not suitable for people with wide feet because it is quite narrow. See also: Speedcross 4 vs Speedcross 4 CS. Speedcross 4 comes with the quick lace system. One nice thing about this system is that it allows you to quickly and easily put on and off the shoe. Also, there is a built-in pocket in the tongue for storing the lace. However, this system doesn’t allow you to customize the fit with a single pull. Hence, some people think that it is not very practical. Speedcross 4 has good cushioning and stability. Note that it has a dramatic drop from the heel to the toe. As the effect, this shoe is especially suitable for climbing steep hills and mountains. But it is not really great for walking or running on relatively flat terrains. 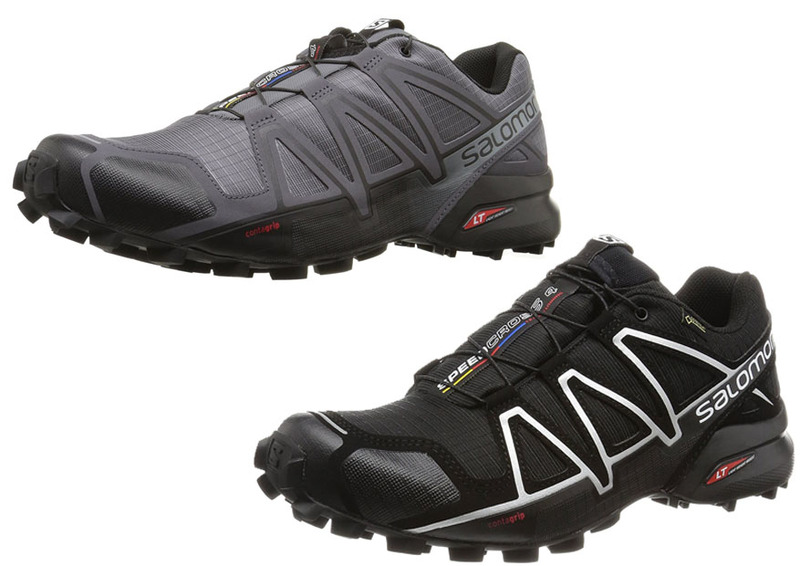 According to Salomon, Speedcross 4 features the Ortholite liner and a thick EVA foam midsole which feels comfortable. Durability and ventilation are two things that may seem contradictory to each other. When you make a breathable shoe, it often becomes not weather resistant. This is the case with Speedcross 4. The said model does not have a weather resistant upper. Hence, although it is comfortable, things become annoying when the shoe gets drenched by rain or water puddles. Speedcross 4 GTX is a variant of the original Speedcross 4 that aims to eliminate a single yet significant problem, which is the poor weather resistance. While the original model has issues when wet, Speedcross 4 GTX is supposed to be more wet-condition friendly due to having the Gore-Tex technology. The lug pattern has also been redesigned to improve the grip and traction on wet, slippery terrains. In usage, Speedcross 4 GTX is indeed more resistant to wetness and splashes. It does not immediately become drenched and slippery. Your feet can stay dry and happy as long as the water does not get to the top of the shoes. This is an improvement to be appreciated. Unfortunately, the performance on wet and slippery terrains is not significantly improved. Yes, the grip and traction feel relatively better than the original model, but it is still not very powerful. You still have to climb very carefully during in such conditions. The other features are still similar. Speedcross 4 GTX also comes with the quick lace system for easy take on and take off. This may be an inconvenient thing for those who hate the inability to adjust the fit with a single tug. - The fourth generation of our legendary Speedcross lug pattern is an even hungrier monster for eating up soft, technical trails. - Feel one with the trail with a precise combination of Sensifit with Quicklace, performance last shape and endoFit. - Aggressive Grip: The fourth generation of our legendary Speedcross lug pattern is an even hungrier monster for eating up soft, technical trails. Between Speedcross 4 vs Speedcross 4 GTX, we recommend you to choose Speedcross 4 GTX. This model comes with the Gore-Tex technology, which allows for significantly better water resistance. The outsole has also been improved, although not significantly.